Russia vs. America: Which Nation Will Dominate Unmanned Ground Vehicles? Following the Russian deployment of the Uran-9 Unmanned Ground Vehicle (UGV) in Syria, many people have speculated what the role of such vehicles might be in future conflicts. While the deployment of the Uran-9 was a failure by most accounts, the technology behind it is progressing rapidly and the next deployment will likely be more successful. America is also developing its own series of unmanned ground vehicles, but how do they compare to Russia’s UGVs? Should they even be compared? Most of the information regarding America’s strategy for developing UGVs can be found in an Army publication titled “The U.S. Army Robotics and Autonomous Systems Strategy.” In it, the Army details five capability objectives that they would like to achieve with UGVs: Increasing situational awareness, lightening the cognitive and physical workload of the soldier, sustaining the force through better logistics, facilitating movement and maneuver, and protecting the force. The objectives are ordered in the order in which they are expected to be achieved. From that, it’s evident that the Army is in no rush to field combat UGVs. To increase situational awareness, the Army plans to field “small UGS” to complement UAVs that perform similar functions, which are unarmed. Reducing the amount of equipment carried would involve the introduction of a light tactical logistics UGV that can provide power and supplies to soldiers. Sustainment is planned to be carried out by a military version of self-driving trucks, allowing supply convoys to drive with less risk and reducing the amount of manpower required to perform such tasks. This is supported in the Army’s vignette of urban operations in 2025, which depicts a squad being supported by logistics and reconnaissance UGVs, but no combat UGVs. Combat UGVs only really enter the picture with the last two tasks: to facilitate movement and maneuver and protecting the force. For facilitating movement and maneuver, the document mentions ensuring “UAS possess the reach, protection, and lethality required for manned/unmanned combined arms maneuver,” implying that they will be armed. In contrast, Russia appears to be focusing on Combat UGVs first and foremost. The Uran-9 is designed as a weapons carrying platform first and foremost. It’s designed to be modular, with different turrets providing different sets of armament for different environments and roles. The Uran-9 and other UGVs developed by Russia appear to be focused on the role of spearheading offensive operations and neutralizing enemy positions in close cooperation with a supporting conventional unit. By sending a robot to go fight, Russia plans to reduce casualties during urban operations and breakthroughs. The armament fit of their UGVs belies this role. They’re loaded with weapons that were proven to be effective in the urban combat Russia experienced during the Chechnyan Wars: thermobaric rocket launchers, autocannons, and machine guns. 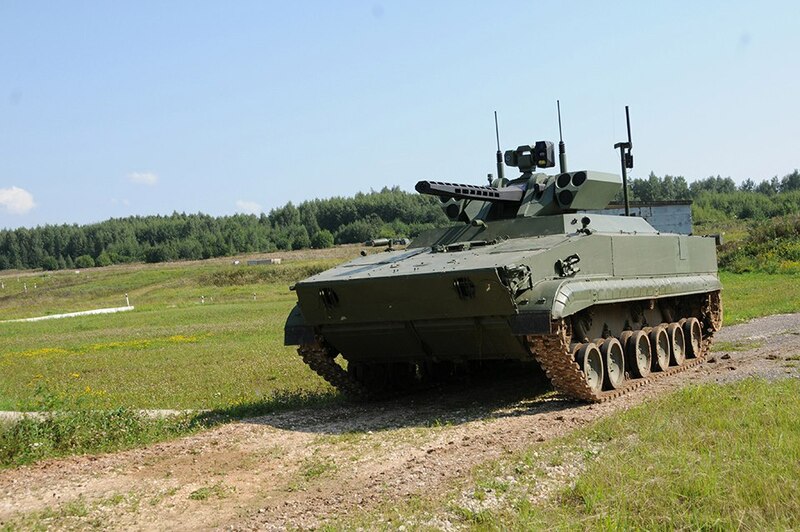 Russian efforts to develop unmanned versions of the BMP-3, T-72B3, and Armata all reflect a similar purpose, a desire to use robots in direct combat. This belies a fundamental difference in philosophy between the U.S. Army’s plan and Russia’s plan. The U.S. Army’s plan focuses more on freeing up manpower to actually fight and reducing risk through gathering more information. When the Army discusses combat UGVs, there’s a significant emphasis on them having the autonomy to move and find targets on their own. Russia’s UGVs aren’t focused on AI in such a way. In their push for Combat UGVs, AI has taken the back burner to simply putting a vehicle out there that a human operator can control remotely. Both schools of thought have the UGVs navigating the most dangerous terrain on the battlefield, but the U.S. Army wants for the robots to be able to do it themselves. There are benefits to both sides. Russia’s approach would be more useful in an immediate low-intensity conflict at reducing casualties, provided the technical kinks get worked out. In a low-intensity conflict, reducing the manpower cost of operations isn’t as much of a priority as reducing casualties, which Combat UGVs would be more important at. On the other hand, it’s easy to see where the Army’s desire for automated logistics comes from. Running long supply convoys is stressful and dangerous for soldiers, and having a robot truck get blown up by an IED is far better than having a manned truck do the same. Both approaches have advantages in a future low-intensity conflict, Russia just puts more emphasis on the killing aspect. The American approach would also allow for the slow development of technologies for the semiautonomous Combat UGV. Making recon UGVs before combat UGVs would lower risk and allow for the sensor systems and command and control network to mature before the role of those UGVs was stepped up to direct combat. That would avoid some embarrassing situations like a total loss of contact for fifteen minutes that the Uran-9 suffered.